Hillary Clinton on Saturday will respond to Donald Trump's scathing speech at the National Rifle Association's annual convention in her own remarks to a group dedicated to criminal justice reform, a campaign aide said. Speaking to the NRA on Friday in Louisville, Kentucky, Trump blasted Clinton as ill-prepared for the presidency and falsely claimed to the audience that Clinton "wants to abolish the Second Amendment." Clinton has never taken that position, although she does support additional gun control measures, and her campaign immediately denounced Trump, telling reporters that he is "peddling falsehoods." Clinton will speak at the Circle of Mothers Conference, an event hosted by the Trayvon Martin Foundation, on Saturday. Martin was the 17-year-old Floridian killed in 2012 by former neighborhood watch captain George Zimmerman. Zimmerman's acquittal sparked protests across the country. Sybrina Fulton, Martin's mother, invited Clinton to speak. According to the aide, Clinton will take on Trump's remarks and tell the audience that she will "not be silenced by the NRA and others and will continue to fight for reforms to protect our children." "She'll talk about how Donald Trump will do or say anything to divide Americans, and how his dangerous ideas -- like mandating that every school in America allow guns in classrooms -- would make our children less safe," the aide said. Trump has said he would get rid of gun-free zones at schools. "I will get rid of gun-free zones on schools, and -- you have to -- and on military bases," Trump said in January. "My first day, it gets signed, okay? My first day. There's no more gun-free zones." He reiterated that promise at the NRA on Friday. Clinton has made criminal justice reform and addressing gun violence a cornerstone of her campaign. After nine people were killed last year during a church shooting in Charleston, South Carolina, Clinton called for universal background checks on gun purchases and more investment in mental health resources. "I lived in Arkansas and I represented upstate New York. 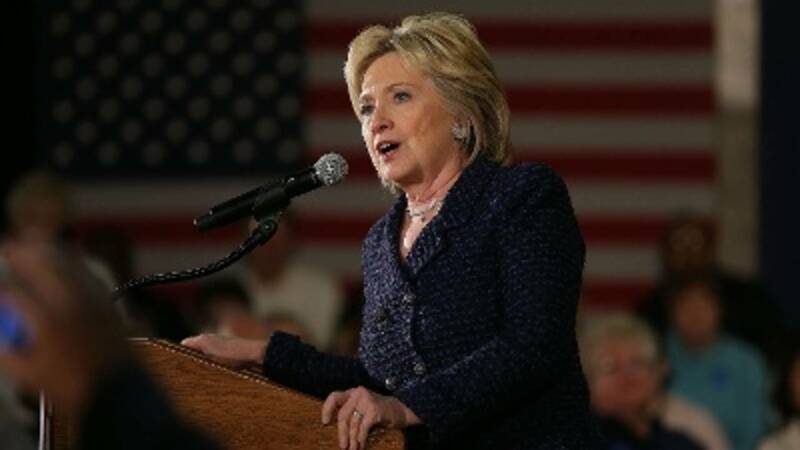 I know that gun ownership is part of the fabric of a lot of law-abiding communities," Clinton said. "I also know that we can have common sense gun reforms that keep weapons out of the hands of criminals and the violently unstable while respecting responsible gun owners."